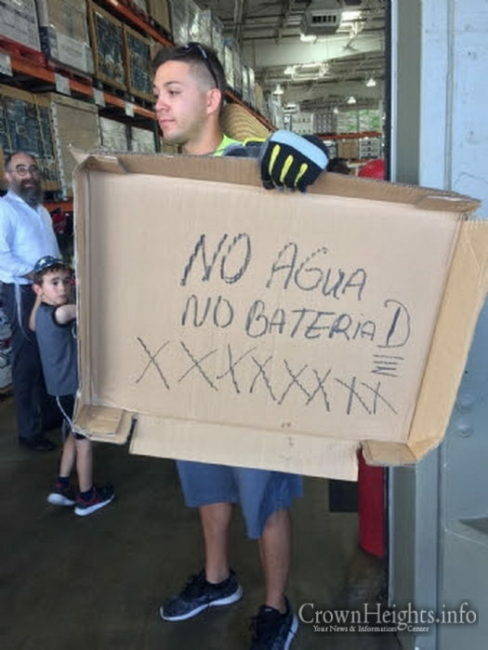 In two letters to his friends and supporters, the Shliach to the island of Puerto Rico, Rabbi Mendel Zarchi, reveals the challenges he, his family and his community faced spending Rosh Hashana as a catagory 5 hurricane Maria bore down on them, as well as the humanitarian effots they spearheaded once it had passed, leaving devastation in its wake. 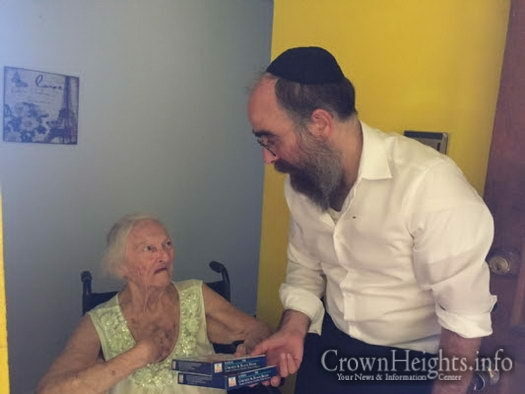 We have been receiving calls, texts and emails from friends and family from all over the world — are we ok, whats going on……..the concern, love warmth and Chizuk was so amazing it cemented the amazing reality that we Klal Yisroel are one family one unit, we share each other’s simchos, and setbacks as if they were our own. Not even for a single moment did we feel alone. We figured we would share a quick note and address all of our family and friends. 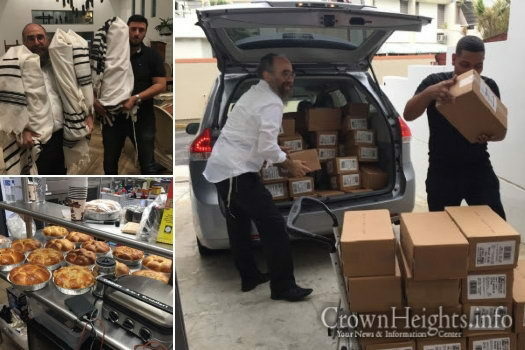 We then reached out to our colleagues in Texas from Chabad Harvey Relief Campaign – Rabbi Moshe Traxler, and in the shortest time feasible they coordinated the arrival to PR of some 1,000 MRE meals available for distribution and three 6000 kw generators. We managed to run over to a few elderly residents before the onset of the storm and deliver meals and water to their great relief and appreciation. 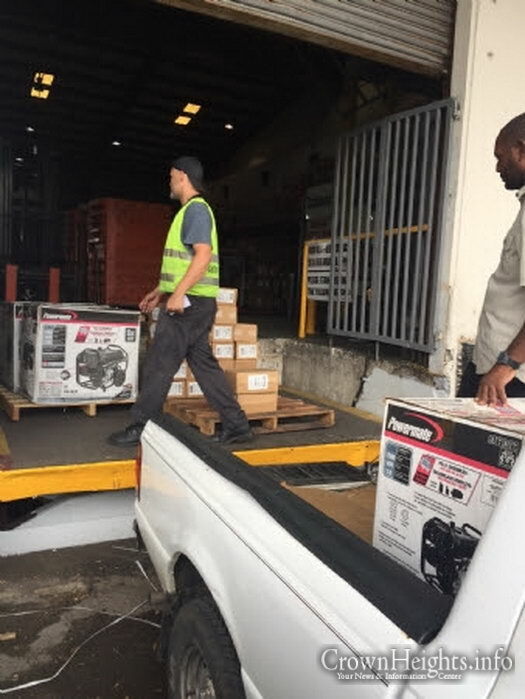 At just about 11:30 pm electricity has gone out in just about most of the island — and we are grateful for the generator that arrived today just before onset of the storm allowing us some light, fan and battery charging. 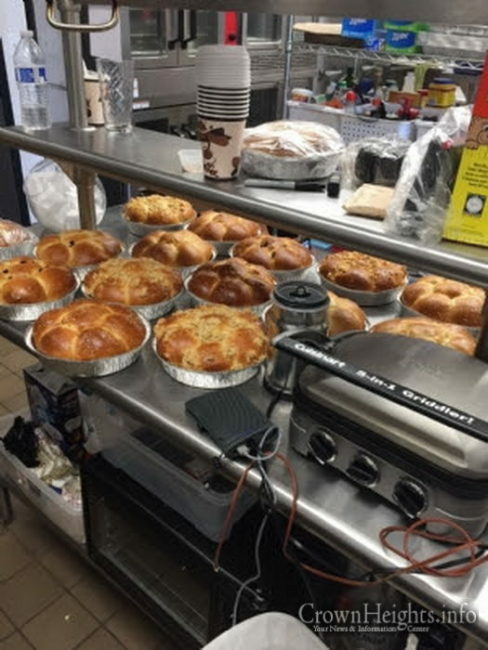 When it is safe to venture out, we will be waiting for you at Chabad for RH davening and warm Yom Tov meals, for lunch and dinner. 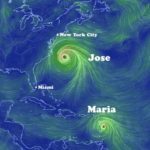 We now await Maria’s visit that is forecasted to be the most brutal in Puerto Rico’s modern history. We hope and pray for divine compassion! Wishing our family and friends a K’siva Vachasima Tova and Shana Tova Um’suka. As we spent the night waiting — we had time to reflect and daven for ourselves the island and all of the neighboring Caribbean Islands. At 5:00 am the howling of the winds were just too much — the street below was a raging river with waves rushing upstream. We moved out to the storage room that is the safest room in the building. The Chabad house has held up relatively well BH for a storm of this monumental proportion. At present the new beautiful Shul is flooded from massive window leakage, this water flowed into the social hall. It seems the roof system comprised of special membrane is completely ripped off and dangling from the sides of the building, constantly threatening the safety of the windows. There are uprooted trees at the entrance of Chabad, ripped out gates, windows of homes just completely blown out. Massive flooding and extremely dangerous winds still ripping through the island will keep people at home. 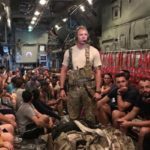 It’s days like these that we see who is the real governing force of the universe – we cannot control the events, it’s how we respond to them that defies us. The amazing achdus and Ahavat Yisroel that has been displayed by our community members texting and calling one another all night to make sure all are safe and ok was so inspiring. We have received calls from England, Israel, Australia and where not. I’m sorry our communication is very poor, the entire island of three and half million people are without electricity. Making it nearly impossible to respond to all of your communications – so a heartfelt band BIG thank you! 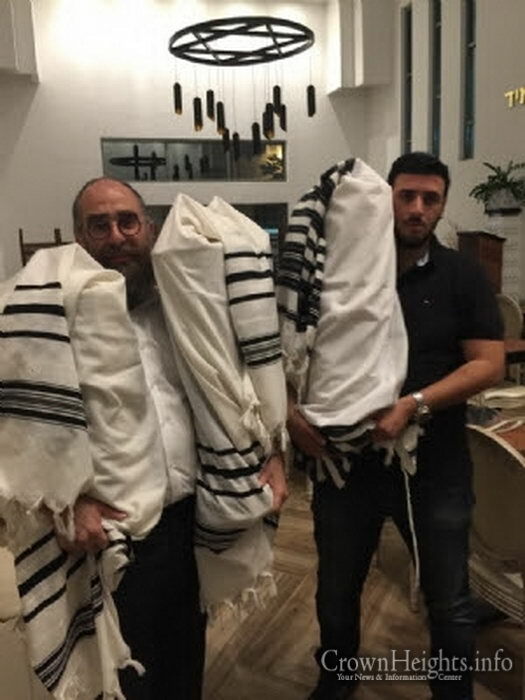 Our chazan’s flight scheduled to arrive yesterday midday, mid flight had to return to Chicago due to hydraulics malfunction, the chazan was rerouted to Atlanta, only to find out upon arrival that the flight took off two hours early to arrive in PR before the SJU airport would be closed down. Now the work begins, with the removal of debris and the clearing out of the hundreds of gallons of water that flooded the Shul and some of the common areas. We will then set the tables, Daven and be ready to share all of our resources, to ensure that everyone that can make it over, can celebrate Rosh Hashana and give thanks to HaShem for granting us life and affording us the opportunity to be his ambassadors here on earth and declaring his kingship. 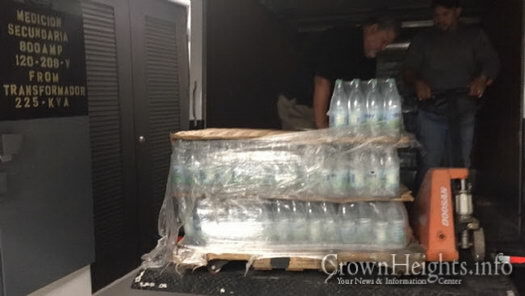 Food and water supplies will be distributed and please G-d we will be able to restock and continue to provide and look after the welfare of our community and the island residents. 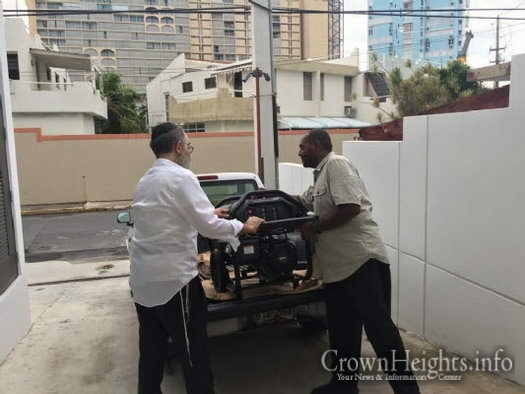 We are in touch with FEMA officials to possibly see if they can use the Chabad center as a location for their relief efforts as well. Thank you to all those who generously shared prayers, good wishes and contributions to help with the ongoing relief efforts and for what is sure to be a painful journey to recovery. With best wishes for a blessed New Year and a K’siva Va’chasima Tova. 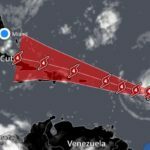 Following Rosh Hashanah and Shabbat We will do our utmost to give you an updated brief of life in Puerto Rico. If you would like and are able to join in the efforts click here – ChabadPR.com/Relief. There is nothing and no one like Chabad chasidim.